I’ve had several requests for a list of our Holy Week traditions. So I thought I’d consolidate them into this post. A reflection on our Easter 2014. I will link back to other posts for more detail, but here they are. Ever evolving (like many traditions), but always with the purpose of making Easter more meaningful. On Palm Sunday we make our Easter Tree. We bring in branches from outside, arrange them in a vase, then tie small pictures depicting the last week of the Savior’s life. I simply found them online and printed them at home, but sometimes you can find them at religious bookshops. This year Eliza painted a nest, symbolizing new life. She wanted it hung right above the Easter tree. So that’s what we did. On Monday or Tuesday I try to attend a session at one of our temples, in remembrance of the second time the Lord cleansed the temple during the early part of Passover week. This is time alone for me. A time of meditation and worship, of remembering what I’ve promised to others and God. You could visit any holy place. Any place you feel close to the Divine. This year, the temple just didn’t happen. I was speaking at Little America to a group of lovely women Wednesday, Doug’s parents were coming home from their mission, and I just couldn’t find the time. So here’s something else I have to say about traditions: Be flexible! It’s okay if things don’t go as planned, if you don’t get to them, or they don’t bring the desired outcome. Reevaluate. Try again. Move forward. During these days we watch videos of Jesus teaching in the temple, and cleansing the temple. On Holy Thursday we share a Passover meal. Right now that means pita and hummus, chicken kabobs, and a few other favorites from our local Middle Eastern restaurant. In the future (as taste buds in our house mature), I’d like to tackle a real Seder meal. But we’re not there yet. And just to keep it real? This year’s passover meal was french toast. Not quite what I had planned. But the week got away from me, I hadn’t made a good grocery run yet, so we ended up with breakfast for dinner. Flexibility, right? That evening we discuss the Atonement and watch videos that depict the Last Supper, Jesus washing his disciples feet, and Gethsemane. This year the Gethsemane video had a significant impact on all my children. Even the boys. Friday morning I pick up hot cross buns from our local bakery. I pre-order them. But next year, I’d like to try making them. Adri, are you reading this? If so, could you share with us your recipe? Was it from Pioneer Woman? Friday afternoon we do our Easter Walk. I’ve written a fair amount about this tradition and how it has become a favorite for my children. But I think the best explanation is at the link above. The past two years we’ve invited friends to come along. These two darlings, our neighbor Alice and her friend, couldn’t get enough of my mom’s crabapple tree. I watched as they picked bloom after bloom and wove them into each other’s hair. Every year our walk is slightly different. Different temperature, different people, with different things coming into color. 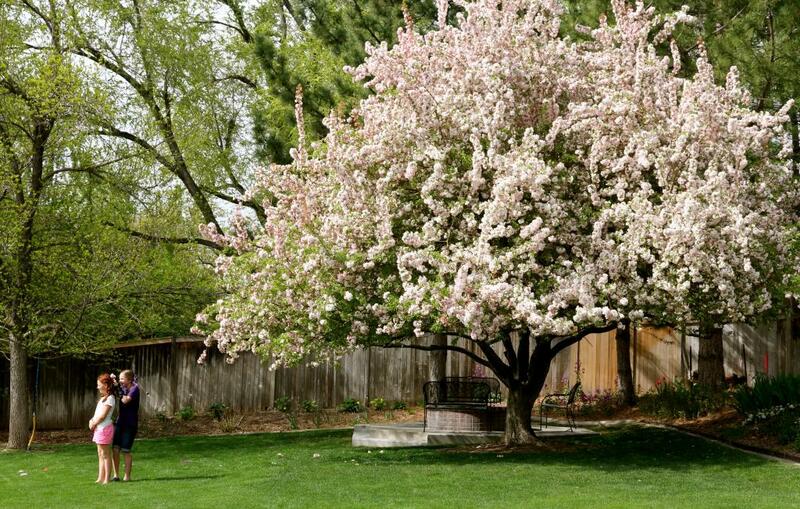 Never before has it lined up so perfectly with the pinnacle explosion of blossoms on this gorgeous tree. These thorns. So sharp. So hard to imagine them bent into a crown. This tiny round stone. To remember the tomb. Gordon’s happy face. With his red tulip. Something alive. Eliza’s happy face. With a bouquet of fireweed. Something else alive. Darling Lilly and her tulip. Also alive. And Ali’s firebug. Very much… alive. My Mom and Erica, who joined us with her children. My Mom’s gardens are beautiful, every season. Friday evening we watch the Crucifixion video – always hard. But important. Saturday we color eggs. Nothing fancy. Just a chance to be creative. This year I boiled two dozen, and I should have done more! Saturday evening we hang our Easter Lanterns in the front yard tree. As dusk slides in, we light them. Seven for now. One for each person in our family. You could line up lanterns on a walkway, porch, or driveway. I tell my children that Saturday is the day of waiting. This is our Easter vigil. We light candles in anticipation of Sunday’s sunrise and remember the morning of the first Resurrection when the earth was flooded with light. The Light of the World. This also has become one of our favorite traditions. It is our small way of declaring that He lives. That He overcame death. That He is the true light. And that when we follow Him, He will light our path, guide us through the darkness. We let our lanterns burn most of the night. This year they were the last thing I looked at before going to bed. I sat in the living room and watched them twinkling their message into the black night, feeling grateful for Christ and his endless gifts of light. Last year Eliza made her own small version of a tomb. This year she built more than a tomb. She built a cross, a church, and a pathway of rocks that led to her tomb. So Sunday morning we went outside to her tomb and rolled the stone away. This tradition is all hers. She started it, she remembers, she rolls the stone back. Then we attend church services. And after church, we hide the anticipated Easter baskets. You know, after a week of talking about the Savior, His life, His Atonement and sacrifice, I don’t feel the least bit guilty about focusing on candy and bunnies for a bit. Because I know the kids understand what Easter is really about. While hiding baskets I looked outside to see all four twins, swinging spider-style. Had to race outside for a few photos. It was such a sweet scene. Then we unleashed the kids to find their baskets. Spencer found his first. The bubblegum-egg-laying-hen was a hit. Sami, with her little bunny. That afternoon we watched the video that depicts the Resurrection, went to Grandma’s house for dinner and an outside egg hunt. Then we came home and crashed. After putting all the kids to bed. A few days later I found this in Ali’s journal. This is exactly why we celebrate Holy Week. Why we talk of Christ, preach of Christ, and prophecy of Christ. So our children may know to what source they may look. For salvation. I can’t believe it’s Maytime. Wishing you a week of undeniable light. p.s. Hoping to see some of you at King’s English Wednesday evening. 7PM. We’ll be in the 15th street Gallery next door. Thank you so much for these wonderful ideas! What lovely ideas on your blog! And what a beautiful space. Thanks so much for sharing. Much appreciated! Samsel – so glad you're enjoying MR. Been thinking about you. When do you perform next? I want to come hear you. Love you friend! I'm doing a fireside May 14. We are having a backyard sound check/rehearsal at my house Tuesday May 13 at 7pm. I was going to invite a few neighbors and friends. I know how busy you are so I'll understand if you can't come, but if you can, bring all your kids to play with my kids! They would love to see you all. I simply don't know how you do what you do. But what beautiful people you are raising with thoughtful activities such as this. Just popped over to review your Easter traditions and plan our Holy Week. We are on spring break this week, which means less regular run-around and more time to enjoy the holiness of remembering our Savior. I'm so excited! Thank you, again, for your inspiration! Happy Easter, my friend!